There are at least three stories that describe the origin of the pond next to Gurdwara Panja Sahib. The entire city of Hasan Abdal is this interaction between mounds and planes, the narrow alleys with their wooden jharokas, abandoned Hindu temples, tall minarets of mosques and some recently constructed plazas, rising and falling as the earth beneath them breathes in and out. However, there is something spectacular about this mountain. The scatter of the city, its ancientness, pales in comparison with the permanence of this mound. The focal point of this historical city is the shrine of Guru Nanak, a vast complex protected by tall walls. Every year, hundreds of pilgrims descend upon this gurdwara from all over the world to celebrate different religious festivals including Baisakhi and Guru Nanak Gurpurab, the birth anniversary of the founder of Sikhism. 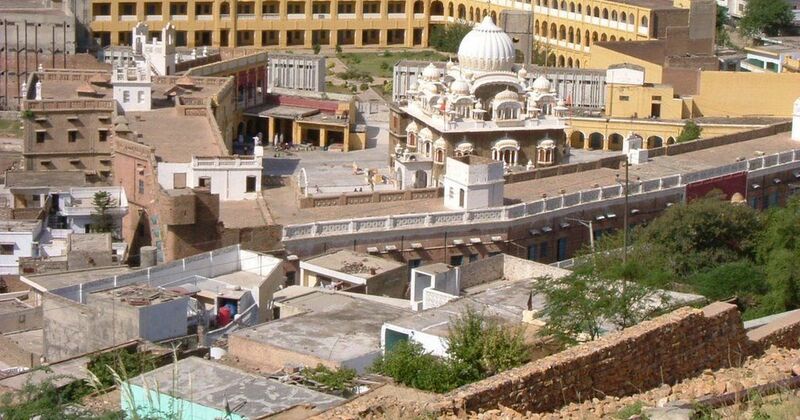 This year as well, when Sikh and other devotees of Nanak come to Pakistan to participate in his birthday celebrations, Gurdwara Panja Sahib will be one of the places pilgrims will be allowed to visit by the Pakistani state. No Muslim, besides representatives of the state, will be allowed within the premise of the gurdwara. Right next to the main entrance of the gurdwara manned by police officials, a tiny stream flows into the shrine. The legend goes that the stream once flowed from a spring on top of the hill, near which lived a local religious figure named Wali Qandhari. This spring was the only source of water for the inhabitants of Hasan Abdal. But once Nanak arrived and started gathering a congregation around him, Qandhari felt jealous and angry as his popularity declined. It is believed that Qandhari stopped the flow of water downstream. Needing water, the people appealed to Qandhari to let the water flow as before. “Go to your Guru, the one you visit everyday now and ask him for water,” he is supposed to have responded angrily. The inhabitants of Hasan Abdal went to Nanak, who sent Bhai Mardana, his disciple and companion, to plead with Qandhari, who in turn is said to have refused angrily and turned him away with the same response. Nanak sent him again, and then again, but to each time come back with the same response. Eventually, Guru Nanak is said to have removed a stone from the ground under his feet, making a stream of water gush out of the earth. The climb up the mountain, which Bhai Mardana is believed to have undertaken thrice to plead with Qandhari, is arduous. On a barren mountain interspersed with a few trees, the authorities have in the past few years constructed a pathway. Many Sikh and Hindu devotees who come to visit the shrine of Nanak also sometimes travel up this mountain. 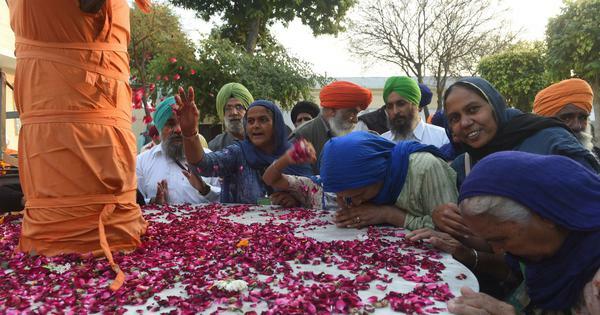 At the time of Baisakhi when the courtyard of Nanak’s gurdwara is swarming with pilgrims, there is a festival arranged here as well. There is a separate date for another festival at the shrine which is unique to it. Graffiti on some of the rocks on this mound present another form of religiosity. “Allah O Akbar”, it says. On a cool morning a few years ago when I undertook this trek, there were several people whom I saw on their way to the lone shrine at the top of the mound. These were young students in school and college uniforms, families with picnic baskets, a few devotional pilgrims carrying their slippers in their hands, intentionally attempting to make this spiritual journey more difficult for themselves. Midway, there was a small bazaar, while there was another one right outside the shrine, selling not only religious paraphernalia but also refreshments. In an empty ground behind the shrine, there were a few dervish preparing a hashish cigarette, with the panorama of the world with its people engaged in their daily grind at their feet. Standing at the edge of the cliff, the gurdwara seemed far away, beautiful with its white dome and a green pool. There are several stories associated with the saint. Some suggest that he prayed on the top of this mountain and then mysteriously disappeared, which is why he is also referred to as the Zinda Pir. There is no grave inside the shrine, but a green box has been put up by the authorities to collect donations made by the pilgrims. Another narrative suggests that the saint was responsible for extracting two streams from these mountains that now flow through the city. In this version, he was not the jealous or arrogant saint who refused Mardana water, but rather the benefactor who gave the city the gift of water. There is yet another story associated with the pond at Hasan Abdal which recalls its reverence in the Buddhist tradition. Hasan Abdal happens to be approximately 20 kms from Taxila and the Chinese Buddhist traveller Hiuen Tsang, who travelled to India in the 7th century CE provides a detailed description of his trip to a place about the same distance from Taxila, with an ancient tank covered with lotus flowers, where devotees would come to pray for fine weather and rain. The pond, according to Hiuen Tsang, had become sacred because of a boon bestowed on a Buddhist king, Elapatra, by the gods. With relics of ancient Buddhist cities and stupas in all directions around the town, Hassan Abdal in ancient India fell within the geographical location of the famed Gandharan civilization.